Rhabdomyolysis results from excessive skeletal (striated) muscle breakdown, releasing intracellular contents into the bloodstream.1,2 Excessive serum levels of creatine kinase, potassium, free radicals, and myoglobin increase physiological stress on the internal organs to maintain life.1,2 In non-athletic endeavors, rhabdomyolysis results from injuries to large portions of skeletal muscle (eg, motor vehicle accidents or crush injuries), systemic infections, metabolic myopathies, and drug abuse.1 Exertional rhabdomyolysis develops from physical effort without traumatic or systemic injury, carrying a prevalence of approximately 26,000 cases annually within the United States.1 Up to 47% of rhabdomyolysis cases result from exertion.1,2 This Pearl of Practice presents recently published resources so athletic trainers can improve their knowledge of the prevention and treatment continuum for exertional rhabdomyolysis. After exertional rhabdomyolysis is suspected or confirmed, clinicians should consider clustering (team rhabdomyolysis): when group conditioning sessions create multiple exertional rhabdomyolysis cases from the same activity. Clusters are observed within a recent systematic review of exertional rhabdomyolysis in athletics because 79% (42 of 53) of the cases evaluated resulted from three specific conditioning sessions.1 Within organized athletics, once exertional rhabdomyolysis is diagnosed or suspected, all individuals who performed the activity should be evaluated while the conditioning protocol is reviewed. The athlete should be comprehensively evaluated to determine whether his or her individual risk of exertional rhabdomyolysis recurrence is elevated (Table 1).6 Following evaluation, the athlete can begin individualized physical activity progression with the assistance and supervision of an interprofessional collaborative health care team.6,7 The systematic review described athletes returning to physical activity within 14 to 30 days following hospitalization, with 7 days being average.1 Recently, information discussing return-to-play criteria following exertional rhabdomyolysis became available.6,7 Asplund and O'Connor6 described a generalized protocol (Table 2) and Schleich et al.7 presented their program implemented on athletes. 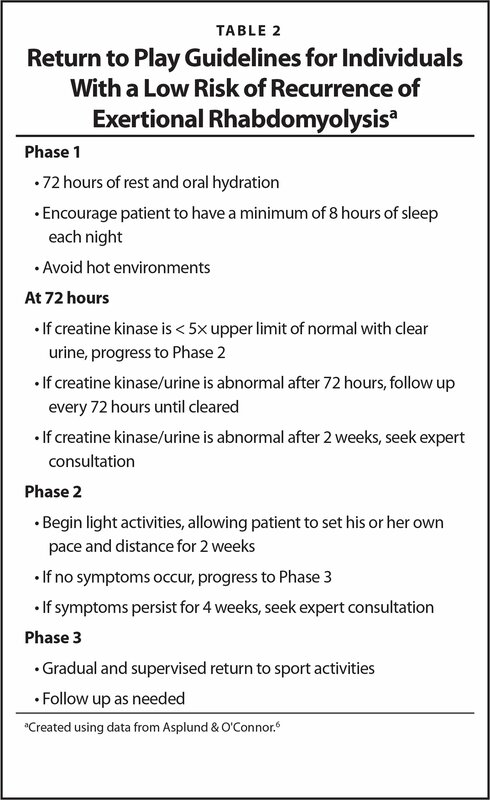 Evaluating comprehensive medical histories and pre-participation physicals examinations for potential myopathies (Table 1) can aid exertional rhabdomyolysis prevention efforts.6 Strength and conditioning sessions must be properly designed, implemented, and supervised by individuals educated in programming principles.4 Discussing exertional rhabdomyolysis with emergency medical services and emergency department personnel increases the likelihood of proper identification and prepares medical entities for potential clusters. 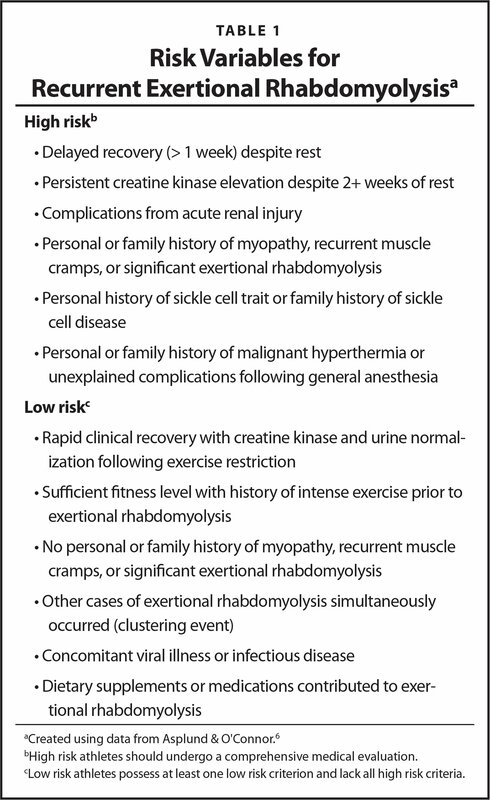 Athletic trainers are qualified to identify situations with elevated exertional rhabdomyolysis risk and should possess the authority to alter or end strength and conditioning activities. From the Division of Health Sciences, Missouri Valley College, Marshall, Missouri (DT); and the Athletic Training Programs and School of Osteopathic Medicine, A.T. Still University, Mesa, Arizona (TVM, CEWB).